I was meant to spend the afternoon in swimming pool water and instead I spent it in proverbial hot water with "Crosswater!" I had a shower and game over! The bath mixer taps would not switch off. Gushing water. .......... I would have to wait in, and deal with the plumber. Despite me already having my swimming cossie on, under my clothes, that was it - swimming cancelled until further notice! So hubby had booked a Dynarod plumber from British Gas who was SUPERB! While we were waiting for him to make his way here from a job in "N18"
I called Bathstore, the retailer of said taps, and was told to call Crosswater. Oh what an apt name considering how CROSS they made me. so she gave me permission to allow the one we'd booked, to go ahead and come out. Right considering I had explained my boiler was off, as was the water, via the stopcock, and me with a 21 month old baby. She said "call me back", once the plumber has made his diagnosis. I trusted she meant that, not knowing she would 100% ignore his diagnosis. Despite me having a similar problem with them 4 times in 4 years, it took me till today to find out what the problem is. They are PILLAR taps, and apparently once you tighten them, you run out of thread, which is when the tap "pops" and basically then turns round and round and round. This evening I turned off my kitchen taps, to take great delight in the fact that when you turn more, they get tighter. You cannot over turn them, as they just get tighter to the point where they do NOT turn any more. As taps should do! This (bath taps pictured above) is not a tap you can tighten. Yet they have the audacity to say that the problem is due to "over turning". Ermmmmmmmmmmm I think when something runs out of thread (as the plumber demonstrated to me today) it is a design fault, rather than a user issue. I want to think of a clever analogy to demonstrate how ludicrous this accusation is, but I am too angry to think. Yes it is my fault that I overturned it, but it is YOUR FAULT that I am able to. I still can't think of an analogy. Despite the plumber today making his diagnosis she wants to send an engineer out, who will then authorise a free spare part (like a cartridge) despite us knowing the problem will reoccur. I said to her that after the stress of today, I don't have time to go down a road, where I know the outcome is not positive. To me, that is madness..... you only replace something, if it needs replacing or has been subject to wear and tear, but what we are talking about here is a product that does not do, what it is designed to do (or in this case, the very design IS the problem). The product is simply NOT FIT FOR PURPOSE - THE END! Beauty of the internet is that companies can no longer fob us off and pretend there is not a problem with a product when there clearly is. 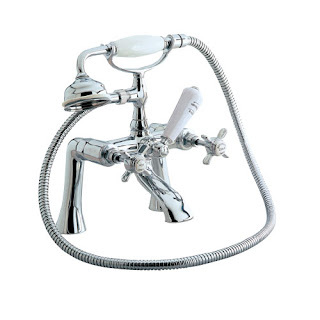 I want a new bath shower mixer (whole unit) preferably NOT Bensham and I want them installed free of charge. I was a DIY Manager in Sainsbury's Homebase for 2.5 years (a long time ago) and I know that it is the LEAST they can do! The plumber today said that installing them would only cost £78. We are not talking the earth here. And every bath and shower time is stressful, as you always know, this could be the time the tap POPS when I turn it off. It is not nice when I spent £4,900 on this bathroom in 2008. Anyway I await a satisfactory outcome and will not be wasting my time dealing (1) with an engineer then further (2) the installation of a spare part to then (3) find myself back where I started. No! Sorry! My time and my life is worth a little more than that. And turning the boiler and the water off today AND missing swimming stressed me out enough ALREADY! Crosswater you have indeed made me CROSS about WATER - at least you do what your name suggests! Michelle from Crosswater said I should send her photos. (1) she never said this when she spoke to me BEFORE the plumber arrived and (2) they wouldn't demonstrate anything other than what the taps look like. I said if you want to see the internal aspects of the taps then surely you can get that internally (forgive the pun) but little did I realise till now, that the info is also freely available on the internet. Any photo I send would show her the same as what she could establish by looking at THIS PDF! For goodnes sake. I spoke to her for so long and we went round in circles with her just spouting customer service gobble de gook! Crosswater are indeed terrible - and so are Bathstore. Bathstore have the contract of sale with you, not Crosswater. Bathstore constantly fob people off to the idiots at Crosswater who's badly designed products fail after a bit of use. They are currently doing the same with me. If you are considering using either company, take a look at the independant review sites via google first - ignore feefoo, it's difficult to trust a site that gets money from Bathstore every month. Did the Internets help with this problem in the end?